In a December 1st letter published on Knoxnews.com, Vaughan D. Hall responded to a November 18th letter urging readers to do more research into the writings of the U.S. founding fathers, such as Thomas Jefferson, in order to understand their intention of using the First Amendment to bar religion from the public sphere. Hall responded by criticizing the author’s assumption as reflecting superficial research in itself. However, Hall’s response is problematic for several reasons: first, Jefferson’s writings do not exactly show acquiescence to the influence of religion in government—if anything, they challenge it; second, if Christian services are allowed to be held in the House of Representatives, it is only fair to allow other religious services—including atheist ones—to be held there as well; third, even if the writings of the founding fathers do allow for religion to influence government, this does not mean that religion should influence government. The Danbury Baptists were concerned that the young republic might institute a church established by law as Jefferson, a Republican, believed the major opposing political party, the Federalists, desired to do. The Danbury Baptists were concerned the Constitution as written was not specific enough and desired reassurance that “no man ought suffer in name, person, or effects on the account of his religious opinions.” Jefferson, seeing an opportunity to respond to the Federalists [sic] charges that he was an atheist, used his response as a political statement supporting the Republican belief that these were things that belonged to the kingdom of Christ. Given this context, suggests Hall, Jefferson was concerned chiefly with preventing government from legislating religion, but also with proving to the Federalists that he was not an atheist by admitting that there existed a separate, divine mediatorial authority to deal with religious matters. He did not intend, suggests Hall, to exclude religious influence per se from the legislative process. But what is the legislation of religion if not the influence of religion in government? Clearly, if a lawmaker’s personal religious beliefs are affecting their decision-making, they are passing laws on the basis of religion. One might argue, “technically, this isn’t passing a law respecting an establishment of religion—just bits and pieces of it.” But that, too, is a means of establishing an entire religion. A legislature can establish religion in an insidious, piece-meal fashion through individual laws rather than through one all-encompassing bill. At the end of the day, what’s the difference? Besides, right-wing, evangelical Christians would be the first to decry an incremental legislation of sharia law by invoking the First Amendment’s establishment clause, so why shouldn’t progressives adopt the same tactic in preventing the legislation of, say, the Pentateuch? So, yes, religious influence in government can and does lead to legislation respecting an establishment of religion. Just look at Saudi Arabia. 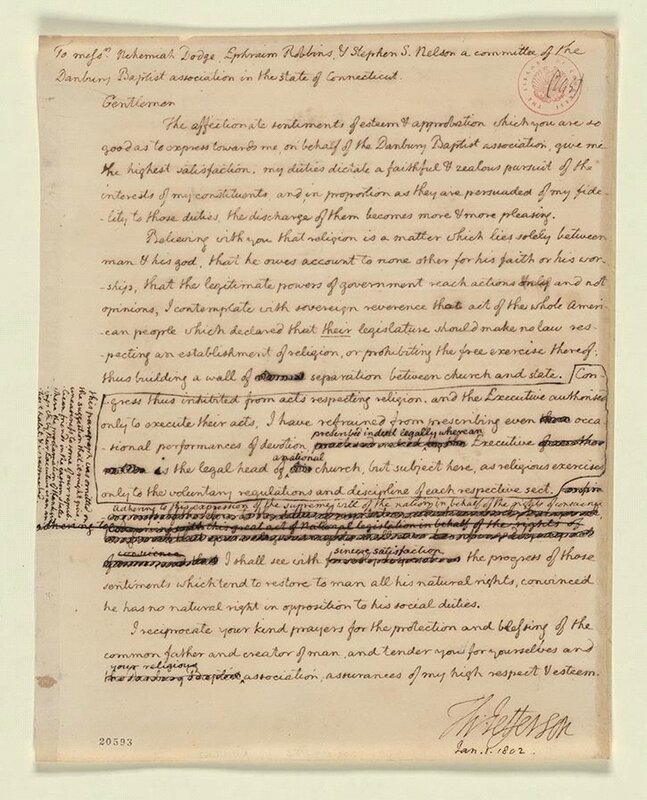 Jefferson saw no problem with religion extending into government as shown by his attendance at a religious service held in the House of Representatives on Jan. 3, 1802. He continued to frequently attend weekly church services held at the House during the remainder of his two terms, also granting permission to various denominations to worship in executive office buildings. The use of government facilities for prayer, sermons, and other church activities, Hall would have us believe, not only proves that Jefferson and his peers were devoutly religious, but that religion should be allowed to influence the legislative process. This is not necessarily so. First, the fact that the founding fathers used the House to conduct religious services does not mean that they believed their services should influence their decision-making. There is a difference between using a government facility to conduct church services on one hand, and passing laws to reflect those beliefs on the other. It hardly makes sense that Jefferson would mention a “wall of separation between church and state” only to break down that wall by insinuating his religious beliefs into the decision-making process. Besides, if Christians are allowed to worship inside the House, it is only fair, then, that other religions be allowed to worship there too—including pagans and atheists. Understandably, many atheists avoid describing their belief system as a religion, given the term’s connotations of blind faith and group mentality, but this is one of those times when it might behoove them to do so. Christians are constantly saying, “Atheism is a religion too!” Well, if atheism is a religion, and if religion should be allowed to influence government, then atheism should be allowed to influence government every bit as much as Christianity. But the differing doctrines of the world’s religions conflict with one another, and they cannot all be satisfied without creating contradiction, so what is the best way of avoiding such conflict? By taking a position of neutrality and excluding religious influence from government. Finally, even if the founding fathers did intend for religion to influence government, so what? We’ll just amend the Constitution. One might argue, “The letters of the founding fathers allow religion to influence government, therefore it is good for religion to influence government.” But this statement is fallacious. First, it presents an is/ought fallacy by stating that something is a certain way, therefore it should be. That something is a certain way does not mean it should be, because the terms is and should are not equivalent. Second, it might be seen as an appeal to authority, which posits that a statement is correct because the person who made it is in a position of authority or respect. That a statement is made by an authority figure does not make the statement correct, though, because that authority figure (in the present case, the founding fathers) might be wrong. If religion should influence government, this conclusion should not be arrived at by an appeal to authority or tradition; it should be arrived at through ethical reasoning and a careful consideration of present-day exigencies. Sometimes when events are placed in their context, they are done so with the effect not of clarifying their meaning or significance, but of distorting them and rendering them utterly meaningless and amorphous, until they lack any common sense whatsoever. 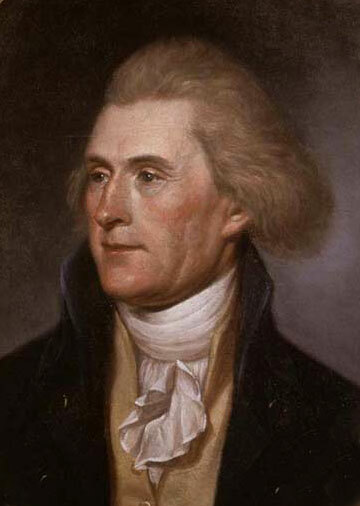 Most likely, though, Jefferson possessed some measure of common sense about the danger of theocracy (even if he was a misogynistic slave-owner), given his and his peers’ understanding of the religious persecution that plagued Europe in the centuries preceding the drafting of the Constitution, as well as their literacy in Enlightenment philosophy. In light of the context, then, perhaps our interpretation (for authorial intent is not always of prime importance) should be that it is inappropriate for lawmakers to dabble in religion while on the clock.